My personal exploration of cocktails, mixology, craft distilling and the Chicago cocktail scene - intended for the thoughtful imbiber. Cheers and welcome! This time of year is pretty crazy in the distillery business, so this post is going to be to the short and sweet. My blogging friends have posted some great holiday cocktails already, such as the Snowshoe, classic Eggnog and Hot Buttered Rum, and Glogg, for starters. Here are a few more holiday cocktail ideas - one with vodka, one with gin, and one with whiskey. They whiskey one is from our friend Charles Joly at the Drawing Room, he serves them this time of year and they are great. The other two have been featured at our tasting events this season, which means they are easy to make in batches, and appeal to a broad range of people. Not exactly high-brow mixology, but delicious just the same. In fact, I'm off to go pour some of these today. Pour ingredients in mixing glass, stir. Fill tall glass with ice, pour contents into glass. Garnish with slice of fresh apple and dash of ground cinnamon and nutmeg. Also delicious served warm instead. Shake ingredients with ice, strain into cocktail glass. Garnish with a cinnamon stick and slice of fresh orange for a fun, festive look. For the syrup, use 1 cup sugar, 1 cup water, 1/2 cup of fresh cranberries and 2" of fresh ginger, peeled & sliced. Simmer 5 minutes, then mash cranberries. Cool completely, then strain. Can be made ahead, and stored in refrigerator for a few weeks. Use a vegetable peeler to cut 4-5 strips of orange peel. Place peels and sugar in bowl and muddle to allow sugar to absorb orange oils. Add hot tea and stir to dissolve sugar, then add remaining ingredients and stir. Grinch Post: When is a Honey Crisp not a Honey Crisp? Recently, I exchanged emails with Leah Zeldes over at the Dining Chicago Blog. I happened to see that she had written about Crispin cider. In her post, she pointed out that Chicagoist had it wrong when they said their newest cider was from honey crisp apples. You see, I have spent at least two Saturdays this fall standing near someone pouring samples of Crispin ciders at area liquor stores, and she was telling people that the cider was made from honeycrisp apples. So of course I wrote a comment on Leah's post saying that she was wrong and Chicagoist was right. Turns out I was wrong and she was right, despite what the marketing rep I had spent time with had said (repeatedly) to consumers. Is it just me, or does it seem disingenuous to label a cider "honey crisp" when it's not made with the uber-popular honeycrisp apple? At a minimum, it's capitalizing on the honeycrisp craze. According to their marketing rep's comments on Leah's post, it is made with honey, and their name is Crispin, so hey, there's honey crisp. And they point to the distinction between the apple name "Honeycrisp" and their name "Honey Crisp." Reminds me a little of Clinton's "It depends on what the meaning of the words 'is' is." 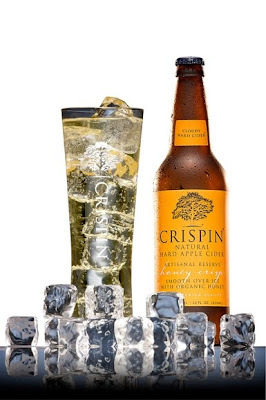 I do like the Crispin ciders quite a bit, and in fact have enjoyed several 4-packs over the last few months with friends and family. Right now, though, I like them a little less. And I don't get the whole pour it over ice thing, but hey that's me. 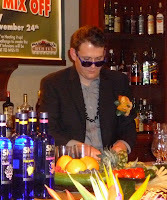 Late last month, I had the distinct privilege to be on the judging panel for the 2009 Illinois USBG Mix-Off/Holiday Party, which was sponsored by Skyy. I must admit I was a bit skeptical of having a tiki-themed event sponsored by a vodka company, but many folks really got into it and it was a heckuva great time. 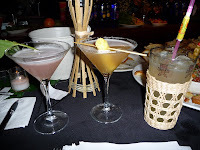 Here are a few pictures of the competitors and the drinks. Pictured mixologists include Lynn House (graham elliot), Kyle McHugh (Drinks Over Dearborn), Josh Pearson (Sepia), Milan Aquarius, Ari Silver (Bice Bistro), Charles Joly (Drawing Room, in the coconut bra), and Todd Appel (Crimson Lounge). In the end, Charles won the competition, and the cash prize - congrats to Charles! The evening ended with a group toast, and much celebration. It was a fantastic evening. Back on October 22nd, the folks at Boka Restaurant Group held the second semi-final of their "Sweet 16 of Mixology," a casual cocktail competition that's been going on all summer and fall. This round saw Zach Friedlander from Relax Lounge (and the coming soon Gilt Bar) against Charles Joly from the Drawing Room. Both competitors brought their A-games and mixed up great drinks. Bacardi 8 was the sponsoring spirit, so rum drinks were in order. Zach modeled his drink after the classic Hot Buttered Rum, with a few twists. He made his own butter mixture, infused with some wonderful spices, and had homemade marshmallows that he roasted with a handheld torch. Charles used some rich spices as well, including Rosehip Liqueur and Pimento Dram along with fresh juices to create a rich, savory concoction. Charles served his punch style, while Zach had heated tureens holding his warmed rum mixture. Both drinks were great, and the vote was close. Zach won the day, and advanced to the finals. The final match, between Benjamin Schiller of Boka and Zach Friedlander took place on Wednesday, November 11th. Unfortunately, I wasn't able to attend, but I heard the drinks were fantastic and the crowd was huge. Read more about it here. Congratulations to Benjamin Schiller, who took top honors! This coming Saturday, December 5th, is the 76th anniversary of the repeal of Prohibition. On December 5, 1933, Utah (yes, Utah) ratified the 21st Amendment to the U.S. Constitution, giving the needed 3/4 majority to end the thirteen year drought of legal spirits in the U.S. 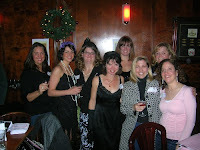 The Drawing Room, 937 N. Rush - the Chicago Ladies United for the Preservation of Endangered Cocktails (aka Chicago LUPEC, of which I am President) will be gathering there for classic cocktails in celebration of the day at 7 pm, and all (21+) are welcome to join the informal celebration. Look for special cocktails and more at this great cocktail bar. Custom House, 500 S. Dearborn - This great restaurant and bar is celebrating the occasion all day (11a-11p) with $5 cocktails honoring the occasion. The cocktails are made with small-batch Midwest spirits, and include choices like the Rock 'n Rye and the "Bathtub" Gin Rickey (made with our No. 11 - can't wait to try it!). In Fine Spirits Lounge, 5420 N. Clark - Join the folks from Templeton Rye (reputedly Al Capone's favorite) in a period-themed celebration of classic cocktails at this great cocktail lounge in Andersonville. Sage Grille, 260 Greenbay Road in Highwood - you'll find a menu of classic pre-Prohibition cocktails for the occasion at this great restaurant, and you'll be in a historic neighborhood for restaurants, where many a moonshiner made hooch during Prohibition in the back alleys. Regardless of where you are, or what you're doing, I hope you'll raise a toast to this most American, most appropriate drinking holiday. Cheers! Hi there, how are you? Good, I hope. It's been awhile since I've posted anything here. There's been plenty going on, and plenty of great drinks consumed, but I somehow fell off the writing bandwagon for awhile. I think I OD'd on it, actually - I had signed on to be the Chicago Cocktails Examiner, and realized that writing two or three posts a week (they actually want four) was too much for me to handle. After all, I do have a full-time job that pretty much takes up all of my waking time, and I try to have a personal life now and then, and I try to write fun stuff here too. Well, I've had a month to ponder it all, and am ready to get back to the blogging. I've got some fun updates from events, as well as some new cocktails I've been working on and such. So stay tuned, and thanks for checking in with me now and then! (c) 2011 Sonja Kassebaum. All rights reserved. Picture Window theme. Theme images by Leadinglights. Powered by Blogger.